The lodge is located in Uco Valley, Mendoza, Argentina, just an hour and a half away from the city of Mendoza. 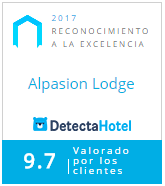 Alpasion Lodge, has 5 luxurious double rooms and 1 family room. All rooms have private terraces, cable TV and Wi-FI internet. Each room has a unique style based on one of the elements: metal, wood, earth, air, water, fire. Three of the guest rooms can be configured as twins if required. Our facilities include a Wine Cellar, to taste an excellent variety of wines from the region, a large dining room, cozy living room to unwind and a library with a fireplace where you can enjoy reading our collection of books. Outside there is a pool with a jacuzzi and a relaxing private garden patio surrounded by olive trees. Our roof terrace, with outside fireplace, is an ideal place for an afternoon drink, offering you a beautiful view of the impressive Andes Mountains. Our cuisine has a distinctive Argentinian style with a gourmet touch, making our meals unique. Spending time in Nature helps us obtain and retain balance in our lives. The healing process of what ancient Oriental civilizations called “The Elements” remind us of how we are a part of the natural world around us and helps us put our lives into focus in a larger context. The guest rooms at Alpasion Lodge have been designed and decorated to enhance the essence of each of these natural Elements.